Contact the Jenison Orchestra Staff anytime! Dan Scott is Director of Orchestras at Jenison High School. Dan came to Jenison in 1997 from Western Michigan University. He has since earned his Master in Educational Technology from Grand Valley State University. His primary duties at Jenison include the 6th Grade Orchestra and the top High School Orchestras. Mr. Scott is also Conductor of the St. Cecelia Youth Philharmonic, former Music Director at the MASTA Junior High String Camp, Camp Director of the MASTA string camps, and has taught at Blue Lake Fine Arts Camp, Knollcrest Music Camp, and Western Michigan University's Seminar Music Camp. He also is a regular clinician at music conferences and school districts around the state. Dan loves residing in Jenison with his lovely wife and two daughters. He spends his free time golfing, listening to podcasts, and spending quality time with his Mac. Carol Johnson is Director of Orchestras at Jenison Junior High. She came to Jenison in 2002, after teaching in the Lansing area for a few years. She earned her Bachelors and Masters degrees in Music Education from Michigan State University, majoring on piano and violin. In Jenison, Mrs. Johnson leads the 5th Grade and Junior High Orchestras. She has experience as the Music Director at MASTA Elementary String Camp, Conductor at the MSBOA Middle Level String Clinics, and Co-director of the St. Cecelia Youth Sinfonia. Mrs. Johnson has also been a featured clinician at the Michigan Music Conference and at many area schools. She has been a violinist with the West Michigan Symphony Orchestra, and is one of the founding members of the Signature String Quartet. In addition, Carol has recently begun publishing educational orchestra literature with Alfred Publishing. In her spare time, Carol enjoys watching game shows, and spending as much time as possible with her husband and two young sons. Jenison Orchestras is pleased to have Joshua Zallar on our staff! Mr. Zallar ("rhymes with dollar") came to us from the Milwaukee area, where he had taught orchestra for the last eight years. A graduate of the Milwaukee High School of the Arts, Mr. Zallar is a very talented violinist. He is excited to be in Michigan, as his wife and her family are all from the Grand Rapids area. Mr. Zallar has a five-year-old daughter and a three-year-old son. Mr. Zallar works with the elementary classes each morning, and works with most of our high school orchestras. Becky Bush is Jenison's newest orchestra staff member! Becky has spent the last several years as an Editor at Alfred Music Publishing, Adjunct Professor of Music Education at Grand Valley State University and Calvin College, and conducting the St. Cecilia Concert Orchestra. Before that, Becky started and directed the Hudsonville Public Schools orchestra program from 2001 to 2006. A graduate of the University of Michigan with a Bachelor of Music Education and of Grand Valley State University with a Masters of Education, she performs as a violist with the Signature String Quartet and is a music director of the American String Teacher's Association Michigan Elementary String Camp. She has taught at Blue Lake Fine Arts Camp, the Phillips Family Fiddle Camps, has presented sessions at state music conventions, The Midwest Clinic, The National ASTA Conference, and has been a guest conductor for many District Honors Orchestras and school orchestras across Michigan. Steve Brook has been a full time member of the Grand Rapids Symphony since 1979, and is currently Assistant Principal Second Violin. He attended Michigan State University as a violin major. From 1979 to 1989, he was the violist of the Fontana Ensemble. 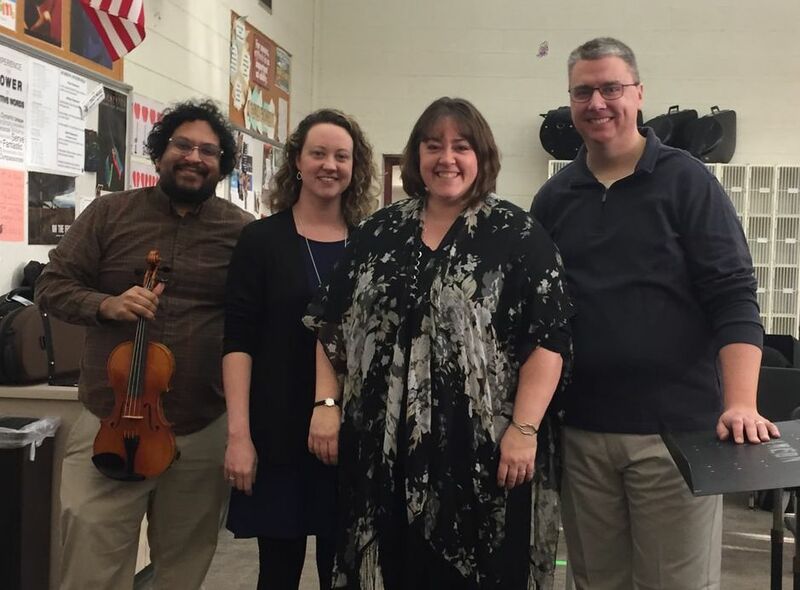 Currently, Mr. Brook is first violinist with the Super Nova String Quartet, a Grand Rapids Symphony educational ensemble that performs in area schools. He has also performed with the DeVos String Quartet on several occasions during his tenure. In addition, he has taught violin and viola at Cornerstone University and Calvin College. For more than a decade now, Mr. Brook has been an invaluable resource to the Jenison Orchestra Program as Artist-In-Residence. He and his wife, Ruth, live in Jenison and have three grown children.